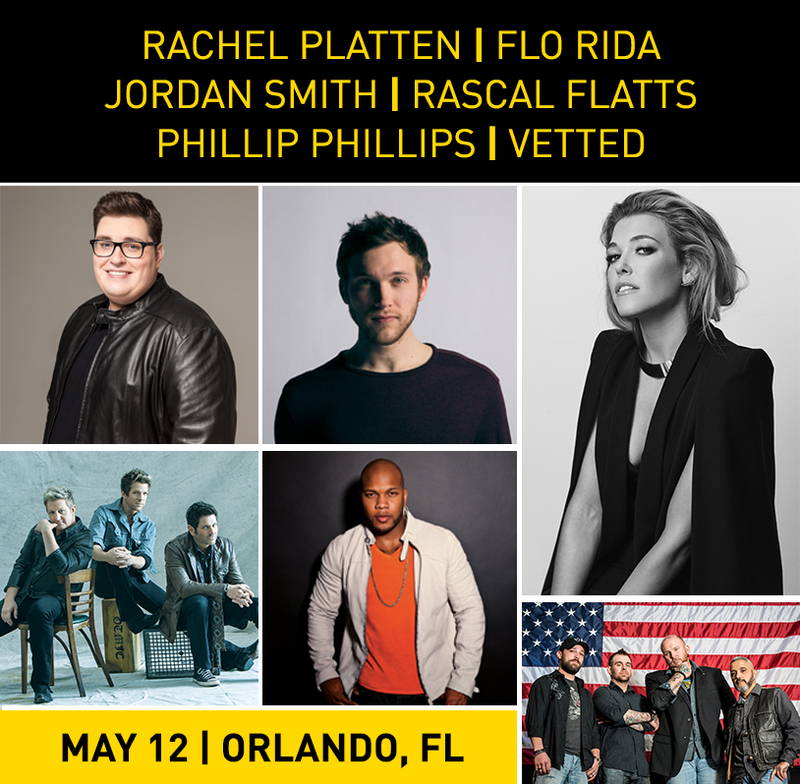 Kissimmee, FL (April 18, 2016) – The Invictus Games Orlando 2016, presented by Jaguar Land Rover and taking place from May 8-12 at ESPN Wide World of Sports Complex at Walt Disney World Resort, today announced a lineup for the event’s Closing Ceremony on May 12 featuring world-renowned talent and uplifting performances. The Closing Ceremony will feature musical performances by international popstar Rachel Platten, who will perform the song of the Games and her No. 1 single, “Fight Song.” The lineup also includes best-selling country vocal group of the past decade Rascal Flatts, American sensation and former “American Idol” winner Phillip Phillips, Florida native and Grammy-nominated hip-hop superstar Flo Rida, “The Voice” Season 9 winner Jordan Smith and the first nationally-recognized wounded warrior band, Vetted. During the ceremony, Prince Harry will recognize competitors for their achievements over the past four days and lead the handover of the Invictus Games flag to the Invictus Games Toronto 2017 organising committee. In addition, the audience will hear firsthand from U.S. Team Captain, retired Army Captain Will Reynolds, as he shares his amazing personal journey. Captain Reynolds ultimately lost his left leg above the knee after an IED in Iraq and endured 26 surgeries. Since his injury, Captain Reynolds has become a husband, a father to four, earned a Masters of Business Administration and Masters of Public Health, embarked on a career with Deloitte and become a world class adaptive sports athlete. Thousands of friends, family and fans will come together to reflect on a memorable four days of competition and celebrate the accomplishments, victories and unbreakable spirits of more than 500 competitors representing 14 nations at the Closing Ceremony, where every competitor will be recognized on stage with a medallion of achievement. Two individual awards will also be given by the Games’ presenting partners, Jaguar Land Rover, at the Closing Ceremony. Spectators, fans and loved ones will watch the Closing Ceremony at the ESPN Wide World of Sports Complex at Walt Disney World Resort in Kissimmee, Fla, while audiences around the world can watch the event live on ESPN 2. Fans can purchase tickets to this unforgettable and one-of-a-kind event for $45 each at http://invictusgames2016.info/tickets/. The Invictus Games Orlando 2016 Opening and Closing Ceremonies are co-presented by Jaguar Land Rover and the Walt Disney Company and are being produced by continuumLIVE and Donaldson Creative with Christopher Laue and Sara Donaldson jointly performing the roles of Executive Producer and Creative Director. Presented by Jaguar Land Rover, the Invictus Games are the only international adaptive sporting event for injured active duty and veteran service members. The Games use the power of sport to inspire recovery, support rehabilitation and generate a wider understanding and respect of all those who serve their country as well as their families and caregivers. More than 500 competitors from 14 countries will compete in 10 adaptive sports. The Invictus Games Orlando 2016 are presented by Jaguar Land Rover. The Official Supporters are the Walt Disney Company, Fisher House Foundation, Fisher Brothers, Sage, Coca-Cola, Deloitte, Experience Kissimmee, Capital One, Invacare and Ottobock. Fans can buy tickets by visiting http://invictusgames2016.info/tickets/. Luxury British automotive manufacturer Jaguar Land Rover is proud to be the Presenting Partner of the Invictus Games Orlando 2016, the international sporting event for wounded, injured and ill servicemen and women using sport to inspire recovery, support rehabilitation and generate a wider understanding and respect of those who serve the country. Since 2013 Jaguar Land Rover has hired over 200 former servicemen and servicewomen in the UK, working closely with the Career Transition Partnership, the Ministry of Defence’s (MoD’s) official provider of Armed Forces resettlement. Details of a Jaguar Land Rover Veteran recruitment programme in the United States will be announced ahead of the Games. The George W. Bush Institute will conduct an international symposium at Invictus Games Orlando 2016 on May 8, to discuss solutions aimed at helping returning servicemen and women improve outcomes for their transition back to civilian life. President Bush will also serve as honorary chair for Invictus Games 2016. The Invictus Games Symposium on Invisible Wounds will convene warriors, experts and community partners to address the scale and scope of invisible wounds (Post-Traumatic Stress and Traumatic Brain Injuries) facing warriors. With representatives from all fourteen nations participating, we will discuss barriers to care, including both stigmas and stereotypes associated with these injuries.